Culture Secretary Tessa Jowell and husband David Mills are to separate, it has been revealed. Mr Mills' lawyer said their marriage had been put under "strain" by the controversy over their finances. Ms Jowell was recently cleared of breaching the ministers' code of conduct - because her husband did not tell her about a £344,000 gift. Lawyer Mr Mills, 60, has denied taking the money as a bribe from Italy's Prime Minister Silvio Berlusconi. 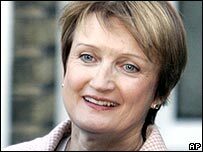 In a statement Mr Mills' solicitor, David Kirk, said Ms Jowell was angry and embarrassed by the bribery allegations. Mr Kirk said: "This whole business has imposed a dreadful strain on my client and his marriage. "He fully accepts responsibility for these pressures and for the situation into which he put his wife, who he knows is entirely blameless in all of this. "He is as mortified as she has been angered by the embarrassment he has caused her. "They hope that over time their relationship can be restored, but, given the current circumstances, they have agreed a period of separation." Tony Blair has not yet commented, although a Downing Street spokesman told the BBC the situation "in no way" affected Ms Jowell's position in the Cabinet. "The prime minister continues to have full confidence in Tessa Jowell," he said. On Thursday, the prime minister cleared Ms Jowell of breaching the ministers' code of conduct by not declaring the £344,000 gift. This came after a report by Cabinet Secretary Sir Gus O'Donnell said if she had known about it, she would have done so. Italian prosecutors have been examining claims the £344,000 was paid to Mr Mills, an international lawyer, in return for helpful testimony in a corruption probe into Mr Berlusconi in 1997. Both Mr Mills and Ms Jowell have denied any wrongdoing. Mr Mills and Mr Berlusconi could now face a corruption trial in Italy. 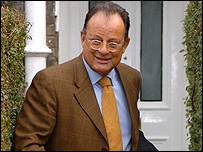 Mr Mills denies the money came from Mr Berlusconi, saying it was from another client. In his statement on Saturday, Mr Kirk added: "My client wishes to state categorically that he has never been bribed by Mr Berlusconi or by anyone on his behalf. "Mr Mills knows that the documents will prove this." Ms Jowell was drawn into the affair after it emerged that she had co-signed a £408,000 loan taken out against the value of their house, which was paid off just weeks later, apparently using the Italian money. But despite being cleared of any wrongdoing, Ms Jowell is facing continuing pressure over her husband's financial affairs, with some calling for her to consider resigning. The former MP, Martin Bell, told the BBC he thought the separation would provide Ms Jowell with "some degree of protection" from the political furore. "It's obviously been a very difficult time and every day more details have been emerging from the Italian prosecutor's office. This is going to continue. "It would continue to damage her and obviously the separation, though sad and even tragic from her point of view, does provide some degree of protection, because I would have thought she couldn't survive much longer". Tory MP Nigel Evans said the separation was a personal matter but the matter of the couple's finances "still leaves questions to be answered and these questions must be answered". MPs offer Tessa Jowell some comfort but will it alter the course of events?